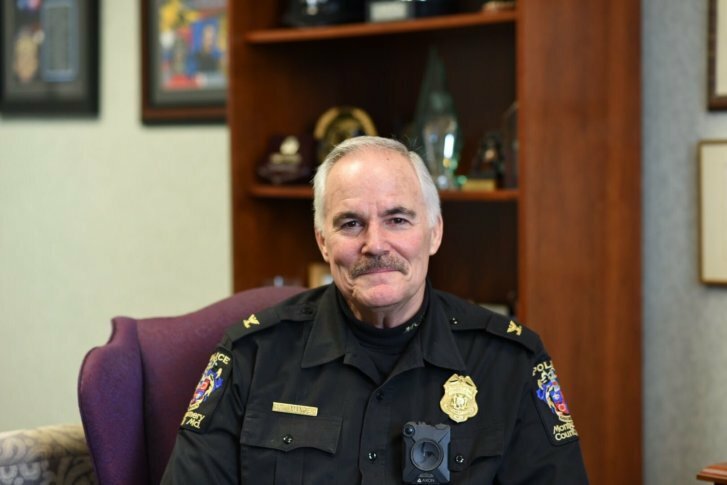 After 42 years in law enforcement, Montgomery County Police Chief Tom Manger will be leaving the department to take a new job but says his departure should not be seen as a reflection of changes in the county's political landscape. After 42 years in law enforcement, Montgomery County Police Chief Tom Manger will be leaving the department to take a new job at the Major Cities Chiefs Police Association. Manger, who took the job as chief of the Montgomery County Police Department in 2004, says his departure should not be seen as a reflection of changes in the county’s political landscape. Manger was hired by then-County Executive Doug Duncan, served under County Executive Ike Leggett and is leaving as former county councilmember Marc Elrich begins his term as Montgomery County executive. All three are Democrats. Manger said he got to know Elrich when the then-county councilmember served on the council’s Public Safety Committee. Assistant Police Chief Russell Hamill has been named acting chief while the search for Manger’s successor gets underway. Manger says there’s talent within the department. “I’ve got two assistant chiefs here who are going to compete for the job and they are amazingly talented individuals,” Manger said, referring to Assistant Chiefs Marcus Jones and Laura Lanham. But Manger says he understands why Elrich is conducting a national search. “You never know who’s going to put in from the outside. It’s smart to take a look at who’s available,” said Manger. Manger says when he started as a young cop answering calls in a patrol car, the public used to accept the ways the law was enforced with little need for explanation or accountability. Today, he said, that’s mostly changed for the better, but there are challenges. Manger says the use of police body cameras has helped sort through the most difficult cases. When a situation that raises concerns about police response crops up — especially in cases where deadly force was used — Manger says camera footage plays an important role. He said police, prosecutors and the courts look at body camera footage and ask: Was it justified and therefore legal? Manger says in most cases where police are called to calm a disturbance or deal with a violent person, things can be brought under control. But when things don’t end peacefully, departments — including Montgomery County’s police department — find themselves under scrutiny. In June 2018, a Montgomery County police officer fatally shot a Silver Spring man, Robert White. Some members of the community protested; White, of Silver Spring, was known in the area and some residents said he was never violent or threatening. The officer’s actions were found legally justifiable. Manger says even when police — like those in his department — are trained in de-escalation techniques, things can go badly and end in a fatality. In 2013, Anthony Howard, a Gaithersburg man, died after police used Tasers on him when he appeared agitated and jumped on top of cars in a neighborhood cul-de-sac, shouting and behaving erratically. Montgomery County settled with Howard’s family after they filed a claim alleging Howard’s civil rights were violated in the case. Manger says police use of Tasers has evolved over time. “Our Taser usage, even our policy, wasn’t as tight as it should be,” Manger said. He added the devices that administer a shock are used when an officer needs control to avoid violence. “It’s not used — and should not be used — if someone’s just not in compliance. You don’t just start off by using a Taser,” Manger said. Manger says he decided early on that he would not ask his police officers to make inquiries into the immigration status of witnesses or people in custody. But he rejects that notion that amounted to making Montgomery County a “sanctuary” county. But Manger said that doesn’t mean those taken into police custody will be protected from federal agents of Immigration and Custom Enforcement once they are no longer the responsibility of the county. “After they’ve served their time and when ICE turns up and says ‘when you let them out we want them,’ I think that’s OK,” he said. Manger said he knows that view is rejected by some members of the community. “As far as I’m concerned, folks that are preying on victims in our neighborhoods, whether we arrest them and prosecute them, our community is safer when they’re not around,” Manger said. Manger said he believes his approach has been beneficial. “When I say ‘be there’ it means, be there for your cops, be there for the public, be responsive to elected officials,” Manger said, adding that whoever takes the job should know that their lives will not be their own. “There’s not a night or a weekend that you’re not out somewhere getting to know someone,” Manger said. When he first took the job, the veteran chief says he remembers thinking the flood of invitations to events — from large chamber of commerce dinners with audiences in the hundreds, to community meetings of homeowners associations with six people attending — would slow down. Manger says that never happened. “You’ve got to say ‘yes’ to every one of those invitations. You’ve got to,” he said, explaining that gaining the public trust begins with getting to know each community. Manger said the new chief will deal with a county where residents have high expectations, and that the growing county is truly diverse. When the outgoing chief was asked about the best day on the job, Manger said with a smile, “I’ve had a lot of best days on the job.” Those include breaking big cases and being able to assist crime victims. Manger said the worst days on the job are when a police officer is killed or injured in the line of duty. Among the cases that hit especially hard was the loss of Officer Noah Leotta, the young patrol officer who died after being struck by a drunken driver in 2015. When Leotta’s body was taken to the medical examiner’s office, there was a procession by police past the station where Leotta worked. Manger says after the procession passed by, he talked to reporters. Manger’s last day on the job will be March 30, and there’s a lot he will miss — but one above all others. Manger was a 21-year-old right out of college when he started in law enforcement, and when asked if he would want to do it all again if he were starting all over, Manger didn’t hesitate. Manger enjoyed that no two days were alike. “I feel like I’ve had a front-row seat to the greatest show on earth,” Manger said. EDITOR’S NOTE: This story has been corrected to reflect where White lived.